Adopting a dog from a rescue centre is a wonderful way to own a loving and loyal pet. There are a few important pieces of equipment that are essential to ensure that the adopted dog quickly fits into his new home. Most of this equipment can be purchased relatively cheaply from local pet shops. Some rescue centres may sell the basic equipment which is a convenient way of purchasing it as well as supporting the rescue centre financially. Collar – although most dogs in rescue centres will have collars, many owners like to give rescue dog a new collar. Rescue centres appreciate having the old collars so that they can use these with other pets looking for homes. Name tag – a newly adopted dog may wander or get lost. Particularly during the early days when he is perhaps getting familiar with his new name and house. While keeping a dog on a lead or contained within a garden will help to stop him getting lost, having a name tag with the contact details of his new owners will help the dog to be returned to his owners in the event that he does get lost. Lead – a lead is an essential piece of equipment. This is required when taking a dog for a walk and also for keeping him under control. There are many different types of lead available. 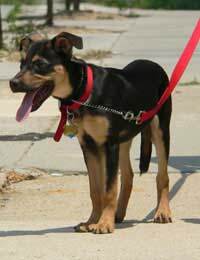 Many new dog owners find a short lead useful. When this is combined with a retractable lead, a dog can be walked close to heal when required as well as being given some extra length when out for a walk in a park or the countryside. Bedding – getting a rescue dog used to his new bedding is essential if families don't want their dog sleeping on furniture or other inappropriate places. A dog that has been adopted from a rescue centre will appreciate his own place and this will give him a feeling of security. A bed can range from a purpose built pet bed through to a cardboard box and old blankets. What ever type of bed that is chosen, removable covers or blankets will make keeping it clean more straightforward. Crate – some owners will bulk at the thought of puppy crates. These are large cages where puppies and dogs are shut overnight or when the owners are out. This can be a useful way of helping to house train a dog. The advantages of using crates is that it keeps the dog safe and secure when the owners are unable to supervise him overnight or for other long periods of time. This is particularly useful with rescue dogs whose behaviour is still unknown. The disadvantage is that some rescue dogs may have bad memories of being shut away and may not adapt well to crates. In this case it is important not to force a dog into the crate. Water and food bowls – a dog must have his own water and food bowls. It is important that the correct size bowl is used that is relative to the size of the dog. Very large dogs, for instance, should have large bowls and these are often better when they are raised from the ground. Toys and chews – dogs, particularly young ones, love to play. Giving them their own toys and chews will help to stop them playing with other items, such as shoes. Keep the toys close to the dog's bed so that he gets used to them as being his. These are the basic essential pieces of equipment required. There are other useful items to have and some of these will be determined by the breed. Grooming equipment, for instance, is essential with longer haired dogs. Getting the basics in place before introducing a new dog into his home will help to settle him in quickly and help him to enjoy his new home and family.